« BG Roxy Concert Videos on G4! 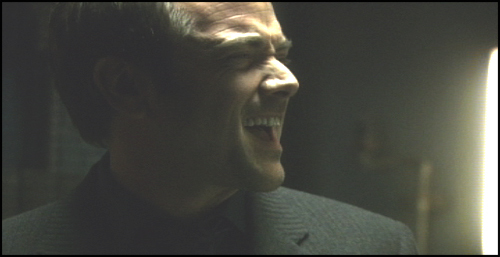 SPOILERS BEYOND: Sine Qua Non features the return of two of my favorite characters from Season 3… Romo Lampkin and Jake, the canine hero of the New Caprica resistance! 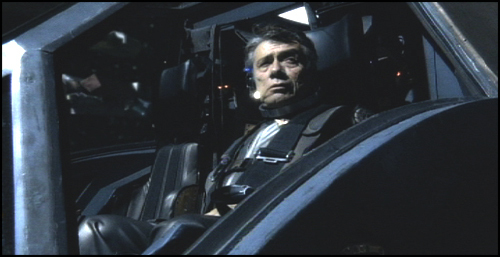 The episode covers a lot of ground, but essentially is about two plotlines: Lee and Romo’s search for a new president, and Adama’s gradual realization that he can not leave Laura Roslin behind. As a result, the vast majority of the score is built from two musical themes, one for each storyline. 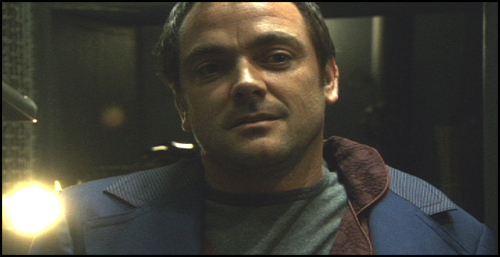 The Romo Lampkin Theme is interesting because his character is a little shady and morally ambiguous. Music for him couldn’t make a strong emotional statement, but needed to be energetic and mysterious. The tune is performed by Chris Bleth, playing a Japanese bansuri in the lower octave and doubling it with a Chinese membrane flute an octave higher. 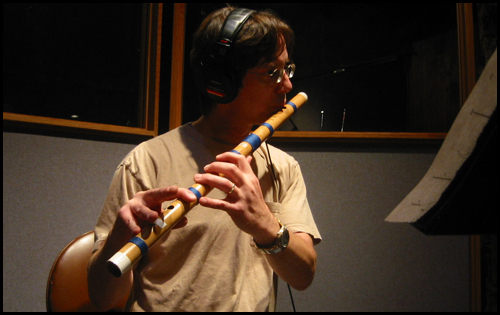 The bansuri is common to the Galactica score, but the membrane flute produces a more piercing sound (listen for it featured on Fight Night from the Season 3 album). The ostinato and the melody are representative of Romo’s character. They slip and slide between a vaguely ominous C minor and an ambigiously dissonant, augmented B major. The theme never truly settles on a particular mode, which emphasizes the wonderful, shady qualities we all love in Romo. 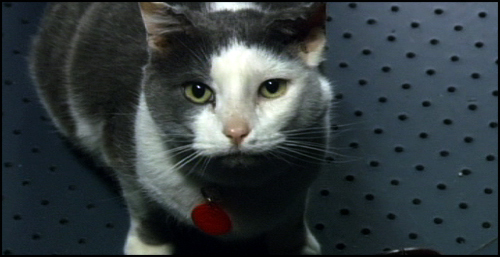 The theme is first stated in full as Lampkin talks presumably to his cat (although technically to himself) and comes to the conclusion that Lee Adama is the only suitable candidate for office. However, I wanted to musically hint that the guy is coming unglued. 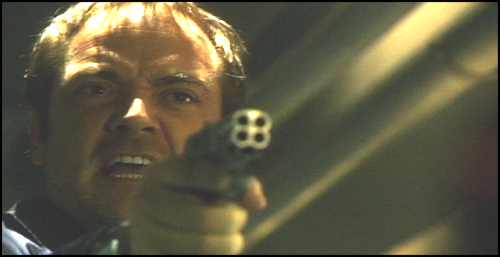 The music needed to set up the sudden shift in character when he pulls a gun on Lee in the next scene. So, the harmonies as he talks to his cat become more dissonant and the arrangement more surreal and dream-like. Small hand percussion is added to the ostinato, creating a tense undercurrent with shakers, claves and tabla. Hopefully, on a first viewing, the score isn’t giving away that the cat isn’t real… but on a second viewing, I imagine it’s pretty obvious that’s what the music is really saying: this guy is frakkin’ nuts. The showdown in the hallway was a frustrating and challenging scene to score. There’s a lot of dialog and exposition, but I also had to keep the tension up. After all, Romo’s holding a gun and could potentially snap and blow Lee away any second. Despite all the talking, I had to remind the audience of this hazard throughout the whole scene. I started by returning to the Lampkin Theme ostinato at the reveal of the dead cat. The membrane flute and bansuri bring back Lampkin’s melody as he spouts his misanthropic tirade against the “dregs of humanity.” The small hand percussion adds to the tension when he says that Fate presented him a choice. ”How do you think I chose?” he asks, before revealing he fled and left his family to die. Here the theme retains an element of insanity, but evolves into a driving, suspense cue with the addition of more intense percussion. The rhythmic motor builds to a climax and ceases as Lampkin yells “Is that it counselor?” The score becomes darker, more bleak. I wanted to suggest that Romo has completely lost his mind and is about to shoot Lee. However, a familiar chord progression begins to build. I felt that quoting The Olympic Carrier was the right musical decision on many levels. First of all, this is a big moment for Lee. His theme and his character were both defined by the events in 33. And his entire speech is about living with the decisions they made in order to survive, at the cost of the lives of others. The destruction of the Olympic Carrier is one of the moments in his life that he regrets the most, though he understands it was a necessary action. I hope the familiar quotation in the score may subconsciously remind the audience of these ideas. The score shifts as Lee taunts him to squeeze the trigger. The Lapmkin ostinato, melody and tense percussion return, leading us to a presumed explosive finale. But, here was my greatest challenge in the episode. This sequence builds tension, but it doesn’t end with a cut to black, or any easily-scored action. Instead, we pre-lap Lee Adama’s voice as he’s sworn into office before we cut to it. This created a problem for me. The tension in the score needed to suggest that Lee was about to get shot, but I couldn’t build the score up to a huge, bombastic finale because it would cover up the dialog in the pre-lap. Frak! However, like all challenges on Battlestar, this one forced me to re-think my approach and ultimately benefitted the music. Because the small hand percussion connected to Romo’s theme doesn’t obstruct the dialog as big taikos would, I was able increase the tension in the score without raising the actual volume of the music. As the scene builds to the conclusion, the percussion, ostinato and membrane flute melodies slowly become softer, the harmonies growing more dissonant. The cue gradually dissipates into the inauguration ceremony. The result is an interesting, unexpected resolution to the Romo storyline. The last quotation of Romo’s Theme (…for now, Mark! Don’t worry, I’ll use it again!) comes as Lee gives him Jake. The producers wanted the music to help underscore that Lee and Romo’s relationship has been restored, so I arranged a brief, but undeniably upbeat, version of his theme for this moment. I re-harmonized the melody so that it was played in Ab Major, while the ostinato stayed in C minor and B augmented. The result was certainly a different, happier feel, but it still retained elements of Romo’s unusual character. Like Lee’s theme, it also goes back to 33, and has since come to represent the long history between Bill and Saul. It’s first appearance in tonight’s episode is a performance on a solo duduk, as Tigh realizes that Adama refuses to acknowledge that Roslin is presumably dead. The arrangement is dark and sinister, setting up the tension in this storyline that will propel the entire episode. However, I tried to keep elements of warmth and sadness in this moment as well. 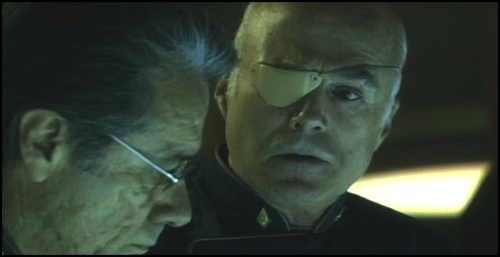 Tigh is heartbroken that his friend is blinding himself to the obvious facts on the ground. Ever since New Caprica, it’s a rare moment when the Colonel feels sympathy for his fellow man, so I wasn’t about to let this moment pass without acknowledging it with the score. Their Military Theme plays throughout the entire episode, always underscoring the scenes between Tigh and Adama. Sometimes tense, bittersweet, joyous or melancholy… and frequently a combination of all. 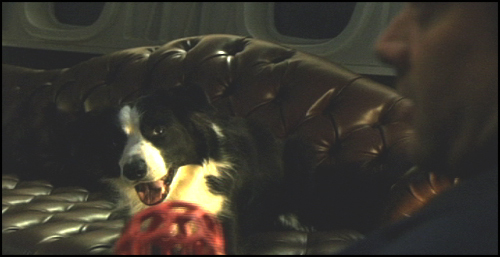 The most lush arrangement comes at the episode’s conclusion, when Adama boards the raptor in his flight suit. The arrangement is noble and simple, with a subtle snare drum and percussion element to give it a ceremonial feel. Interestingly, the Roslin and Adama theme also plays an important role in this episode, even though Laura is literally never on screen once in the entire show. But, in a way, the entire episode revolves around her. 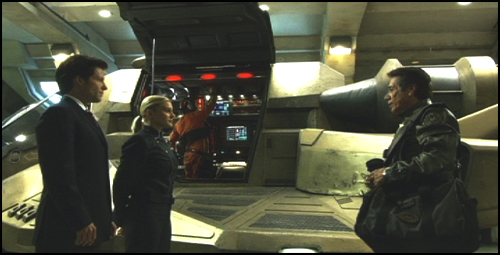 It first plays as Lampkin speaks with Adama on the hangar deck. ”Sine Qua Non, as they say: those things we deem essential, without which we cannot bear living.” As Romo’s words sink in, Adama realizes that Laura Roslin is who he cannot live without. Here, the Roslin and Adama love theme underscores this absolutely critical turning point in the story. Adama stays behind to wait for Laura. The fleet leaves him alone in the vast, cold void of space. The score is a steady, clock-like percussion rhythm, emphasizing rim hits on the taiko drums. But, there are no thematic elements or melodies. I didn’t want to comment on anything emotionally for this shot, but intended to capture only Adama’s emptiness and loneliness, to emphasize the long wait in store for him. As the camera pulls back from his ship, the percussion decrescendos to a whisper, finally ending with a solitary bass drum. Adama’s raptor drifts as the score is reduced to a heartbeat in the darkness.